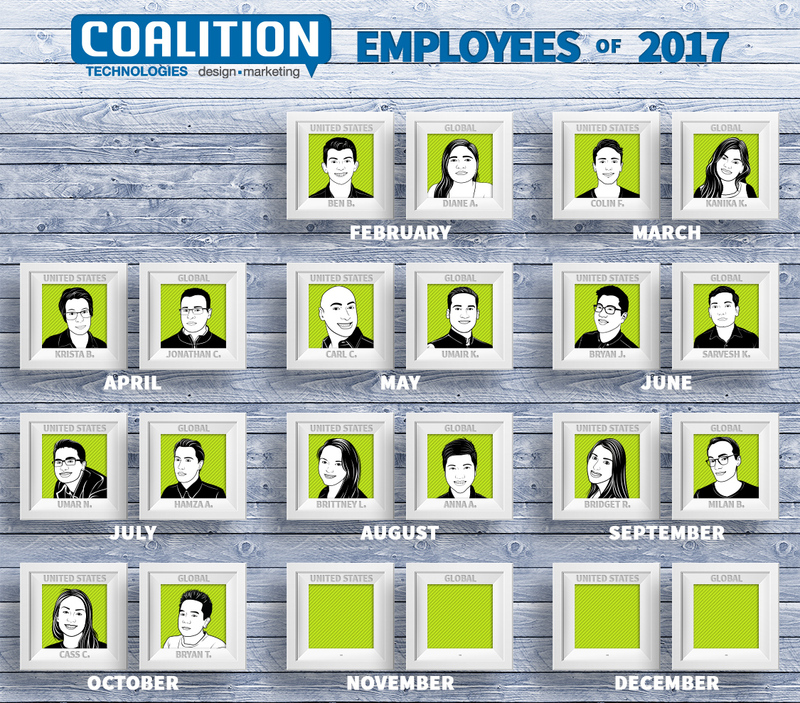 Coalition Technologies has some of the best marketing, development, and advertising team members in the world — with employees based all over the United States, as well as the Netherlands, India, Brazil, Slovakia, the UK, Pakistan, and so many more! 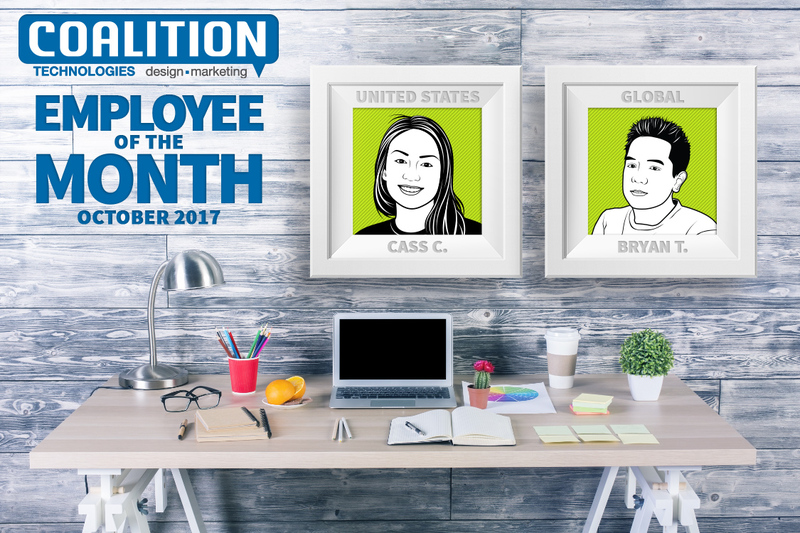 To choose just two employees to highlight each month is a challenge, but Cassandra and Bryan really made a difference in October, so we’re giving them props as our employees of the month! Cassandra, also known to our team as Cass, started at Coalition Technologies in June of this year! As a Digital Strategist, she got right to work providing professional consultations for future clients, helping plan and analyze their websites, SEO and PPC strategies, and building contracts, estimates, and negotiating on Coalition Technologies’ behalf. She spends much of her time managing various accounts — whether they be web design and development or long-term SEO campaigns. She coordinates a group of our team members to ensure client work gets done on time. Assessing quality and timely delivery of work is one of Cass’s biggest assets! In her short time with us, Cass has worked across a number of industries including fashion, financial services, skincare, health, jewelry, and even video games. One of her favorites is Ayr Skin Care, an emerging natural beauty brand! Her consistency in sales and contract management has been her biggest win, but she says she still has more to learn. Learning new things every day is what makes working at Coalition Technologies fun for her! When she’s not at work or snacking in our fully stocked kitchen, Cass loves spending time outdoors running and rock climbing. As part of the Coalition Technologies team for just over a year, Bryan started as a Recruiting Assistant back in October of 2016. He spends much of his time reviewing skills tests, as well as responding to the applicants who reach out to Coalition Technologies online. He doesn’t work with our clients, but instead, helps find more team members to join our ever growing family. His favorite moments at Coalition Technologies include the holidays when our team members go all out celebrating. From our Halloween costume contest and Thanksgiving potlucks to our Diwali decorations — coordinated all the way from India — Bryan loves seeing the time and effort our team puts into making others smile! What’s his favorite thing about CT? That his thoughts and ideas are always taken into consideration when working to improve our company. While Bryan is dedicated to his work at Coalition Technologies, he’s also a bedroom guitarist who spends a lot of time playing in front of his (electric) fans. At Coalition Technologies, we’re on a mission to work with the best people in online marketing and website development! Each of our team members deserves a spot as an employee of the month, so who will be next? Stay tuned to find out about our November champions.